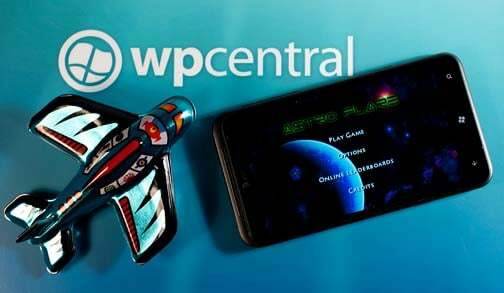 Astro Flare is a space shooter game for your Windows Phone. It's a fast paced game with plenty of bad guys to blast into smithereens. Astro Flare has six game modes, unlockable ships, and plenty of power ups to help you battle against pesky enemy ships. Astro Flare is also an OpenXLive game that gives you access to the OpenXLive leaderboards and social network. If you like action packed, space shooters you might want to take a look at Astro Flare. The main menu of Astro Flare presents you with options to play the game, access the game's options, tap into the OpenXLive leaderboards, and view the credits. Astro Flare gaming options covers turning on/off the sound effects, music and vibrations as well as choosing your space ship controls. You can also choose to hide the joystick knobs. Your space ship can be controlled in the following manner. Tilt Motion: tilt the phone to move the ship. Dynamic: Tap and hold the screen and the ship follows your touch. Static: Virtual joystick appears where you tap and hold the screen. Fixed Position: The joystick is in a fixed position. Movement controls will be on the left side of the screen (green joystick) and the fire controls are on the right side of the screen (blue joystick). You do have the option to select auto-fire prior to entering the game. This is a nice option to allow you to concentrate on navigation. From Astro Flare's main menu you can access online leaderboards which is basically access to your OpenXLive Lobby. From here you can tap into OpenXLive's leaderboards, achievements, announcements as well as viewing/chatting with other online players and view other OpenXLive games. Before you jump into the game, a Gaming Menu will appear with options to access the game modes, upgrades screens, and instructions. As you play the game coins will drift about from destroyed enemy ships that can be used to upgrade your ship or purchase new ships. Rampage: Fight waves of enemies with ever increasing difficulty. Rampage – Timed: 5 minute timer. Alter Ego: Battle an AI controlled clone of your ship who will fight you as well as collect/steal powerups and kill enemies for score. Alter Ego – Timed: 5 minute timer. Time Bandit: Start with a 60sec countdown. Collect time powerups that will briefly slow time around you as well as increase your countdown timer. Extermination: Pit yourself against a horde of alien space bugs that break down and split into additional enemies when killed. The game screen has your vital statistics in the upper left corner of the screen. This includes the score and ships health. Game play within each is fast paced. Bombardment is a good word to describe how the enemy ships come after you. To help give you an edge, there are numerous powerups that drift by that will give you extra firepower, defense charges, and homing missiles. There is one last screen that will appear before the game starts that will display your scoring statistics. You also have the option to turn on/off the auto fire feature that will automatically fire your weapons when an enemy ship gets within range. Astro Flare is a very nice space shooter for your Windows Phone. The pace of the game will keep you challenged, graphics and animations are nice, and overall the game was fun to play. Combine the six game modes, OpenXLive integration and ship upgrades Astro Flare won't get old quick. There is a trial version available for Astro Flare that will let you play the full Rampage mode. The full version will run you $1.99 and you can find it here at the Windows Phone Marketplace.